In Necrotic Gnome’s fascinating Dolmenwood campaign setting, adventurers explore an ancient, enchanted forest, filled with haunted ruins, dangerous monsters, mysterious sects, capricious fairy lords, and rival political factions. The beautiful OSR zine, Wormskin, has been the main conduit for Dolmenwood content so far. Necrotic Gnome recently released the eighth issue of Wormskin, so I thought I’d share my thoughts about what’s become one of my favorite campaign resources. Wormskin is available in PDF and Print-on-Demand from DTRPG. In Wormskin, Necrotic Gnome takes familiar magical-forest tropes familiar to modern roleplayers and rolls them back to an earlier time. This isn’t Tolkein’s Myrkwood or Rowling’s Forbidden Forest. Dolmenwood is older, stranger, and more complicated than you suspect at first. Of course, monsters haunt Dolmenwood—fey, undead, draconic, and much more—but there are several larger, much longer games afoot. While the common folk struggle just to stay a step ahead of threats such as wild beastmen, vicious kelpies, relentless antler wraiths to hungry bile wyrms, rival factions of sorcerers, aristocrats, elf lords, witches, and dark powers struggle for control of Dolmenwood’s arcane resources. A campaign that opens with novice adventurers rescuing of the wainwright’s daughter from almost comical barrowbogeys might conclude with a company of heroes invading the Otherworld to restore the barrier that banishes the Cold Prince, a faerie lord who once ruled over all of Dolmenwood. Along the way, they may smuggle illicit fungi out of the wood, discover the long-forgotten secret of a haunted abbey, or kidnap a goatman noble for ransom. Champions and scoundrels of all levels will find plenty Dolmenwood to fill a busy career of adventuring. Although it’s billed as an OSR campaign setting, Dolmenwood doesn’t draw from Tolkein, Howard, or any of their imitators. Instead, it draws from the medieval fairy tales and folk literature. The authors cite Lord Dunsany and William Morris as influences, along with the modern fantasy author Susanna Clarke. Personally, I see in Dolmenwood reflections of the fairy tales of the Brothers Grimm as well as Alice’s adventures in Wonderland, and the fey denizens of the wood remind me strongly of Poul Anderson’s Three Hearts and Three Lions, as well as Greg Baer’s magnificent Infinity Concerto and The Serpent Mage. A campaign set in Dolmenwood will have a distinctly different flavor than most players are used to, but it will not lack for interesting and dangerous things to do. Every issue of Wormskin expands the Dolmenwood campaign setting, revealing the history and politics of the region, creating new PC races specific to the setting, and describing the indigenous monsters right down to individual traits and encounter hooks. Several adventures of varying length have been presented, along with rich content for exploring the lands of Dolmenwood hex by hex. And throughout every issue are tables of creative detail for almost every topic, which can be used as a la carte menus or random generators to enrich the flavor of your campaign. Apart from the specific history articles, which make up a fraction of the total page count, everything in the zine can be lifted out of Dolmenwood and dropped into any existing fantasy campaign, making the percentage usable content amazingly high. Map of Dolmenwood – a hex-map spreading across two pages, depicting the entire wood. This map is the basis for the hex-crawling features in subsequent issues; a single-page version can be downloaded for free. Moss Dwarf race-class – a unique playable race of forest dwelling little people with a natural affinity for Dolmenwood’s rich fungal fauna. Fungi of Dolmenwood – an extensive article on fungi of the forest, including a 6-page d30 table to generate unique ‘shrooms for your game. Grimalkin race-class – a playable race of demi-fey feline shapeshifters, trickster spellcasters with four unique spells. Root Thing – Wormskin‘s first original monster, a creepy predatory plant. Common Tavern Fare – a d30 table of medieval dishes to give your tavern flavor. Psychedelic Compounds – details on 30 different mind-bending substances encountered in Dolmenwood, along with a six-page d30 table to roll up thousands more. High Wold – hex-crawl through seven strange hexes where human and goatman aristocracy mingle…and wed! Of Men, Goats and Fairies of Dolmenwood – a 2,000-year history of the wood, tracing the rule of the elf lords, the goatman nobles, and the human aristocracy over Dolmenwood. Also tracked are the activities of the Drune sect, the Church of the One True God, and the Nag-Lord. Languages of Dolmenwood – a complete listing of the ten major tongues spoken in the wood, who speaks them, and to whom. Summerstones and the Witching Ring – the magical standing stones that block the Cold Prince, former fey ruler of Dolmenwood, from returning to our world. The Woods East of Lake Longmere – seven more hexes of Dolmenwood surrounding the ruined Abbey of St. Clewd, with at least one engaging encounter in each. The Ruined Abbey of St. Clewd – the first half of a full dungeon module, this issue covers the surface ruins of an ancient abbey, long believed to be haunted. Atacorn’s Retreat – a full evening’s encounter with Farthigny the Atacorn, one of the sinister Nag-Lord’s strangest and cruelest minions. The Fickleness of Fairy Magic – a brief table describing the strange circumstances under which fairy magic may fade unexpectedly. The Ruined Abbey of St. Clewd – the 40-page conclusion, in which the adventurers explore a vast dungeon beneath the Abbey, and discover the fate of the monks who dwelt there before it was sacked. The Watchers of the Wood – a full expose on the ancient order of the Drune, Dolmenwood’s secretive sorcerors. If you thought they were just Dolmenwood’s version of a druid, you couldn’t be more wrong. Hex-Crawling in Dolmenwood – GM advice on running an old-school hex-crawl game session, tailored for Dolmenwood but applicable to any campaign. Hag’s Addle – seven more hexes of Dolmenwood detailed, with intriguing encounters in each. The Hag of the Marsh – a 12-page treatment of dominant power in Hag’s Addle, a mystical crone of vague origin, who can serve as an evening’s adversary or a long-term nemesis, or perhaps even an uneasy ally. Monsters of the Wood – write-ups of four new foes, including a typical Drune brother as well as the Flammbraggyrds, former fighting men transformed into bizarre spirits of iron and flame. The Fairy-Lords of Dolmenwood – Details on the top sixteen members of Elfin aristocracy in and around Dolmenwood. The adventurers will certainly find foes and rivals among them, but can they discover an ally? Brackenwold Calendar – describes the days, months and holidays according to the Brackenwolders, and explains the unusual way in which the normal turn of the seasons can be undone within the strange forest. Prigwort and Surrounds – hex-by-hex coverage of the region surrounding Prigwort, the village known for making the finest spirits in Dolmenwood. Found in the region is the rich lair of Chasobrithe the Bile Wyrm, a dangerous foe to challenge higher-level adventurers. The Baker’s Dozen – a whimsical but dark scenario in which the adventurers meet an eccentric family of bakers living in the deep wood, but soon discover that Mother and her girls are keeping dangerous secrets. People and Places of Prigwort – Coverage of the denizens and locales of Prigwort, which can be mined for ideas or inserted as a whole into your world, if you’re not running a pure Dolmenwood campaign. Spiritous Beverages – information on the special brews of Prigwort, including a four-column d30 table that can be used to generate unique liquors for any fantasy setting. Monsters of the Wood – includes the classic fey beast, the Kelpie, as well as the special dragons found in Dolmenwood. These wyrms are associated not with metals or colors, but the five bodily humours (black bile, phlegm, blood, yellow bile, and ichor)! Common Names in Dolmenwood – six pages of d30 table with suitable names for all of Dolmenwood’s playable races and classes. Henchmen of Dolmenwood – rules and tables for recruiting and retaining hirelings in Dolmenwood; along with the Common Names tables, a valuable resource for any OSR fantasy campaign. Drigbolton and Surrounds, East of Prigwort, and From Langshorn to Dreg – hex-crawling coverage for three more regions in and around Dolmenwood, with describing interesting encounters in each of 21 hexes. Monsters of the Wood – an essential collection of potential foes, including eerie Antler Wraiths, the mystical Audrune and the crafty Drunewife, a typical Dolmenwood Witch and three ancient wood-god patrons, and NPC versions of the Moss Dwarf and Woodgrue. The Sisters of the Chalice and the Moon – exposing the inner workings of the witches of Dolmenwood, a shrouded sisterhood devoted to the service of the ancient wood-gods. Camping in Dolmenwood – detailed rules and tables for camping during cross-country excursions, applicable to any OSR campaign. Strange Waters – a four-column d30 table for creating unique sources and properties, both mundane and magical, for water sources in any campaign. Monsters of the Wood – Five sentient fungi found in Dolmenwood, but useful in any campaign in which the adventurers are exploring a dark and mysterious forest. Obviously, I consider Wormskin well worth reading, but you may not be comfortable sinking more than $40 into a PDF fanzine on just my say so. With that in mind, let me recommend some routes into this ancient forest. Welcome to Dolmenwood (Free, 6 pages), a six-page introduction to the campaign setting. It establishes the mood of the region, and briefly describes the people, places and major factions of this strange and ancient forest. Welcome to Dolmenwood makes an excellent Session 0 handout for players in a new Dolmenwood campaign, before they create characters. If you’re looking for a dungeon adventure that will can several play sessions, and can be dropped into any campaign, start with Wormskin #3 and #4. “The Ruined Abbey of St. Clewd” is an excellent old-school dungeon, with an enigmatic past and a strong theme. As an adventure bonus, “Atacorn’s Retreat” (Issue 4) is a one-shot encounter that pits the party against an insidious, supernatural enemy for a full evening of play. “Atacorn’s Retreat” could be inserted into a cross-country journey in almost any OSR campaign. If you’re looking for campaign background material that you can use to enrich an on-going campaign, you might start with Wormskin #8. All four features in that issue would work equally well in any campaign setting that includes a vast, ancient, and magical forest. If you’re contemplating starting a fresh campaign using Dolmenwood as a whole, you’ll want to pick up the entire Wormskin collection. You may as well take the time to read them in order—the first issue is good, and they just get better. You should also download The Dolmenwood Referee’s Map (Free) and The Dolmenwood Calendar (Free). Necrotic Gnome has recently released its first adventure set in Dolmenwood, The Weird that Befell Drigbolton ($10, 60 pages). While Drigbolton would make an interesting adventure for any OSR campaign, I don’t recommend it as an early adventure for a new Dolmenwood campaign. Not only is it better-suited to mid- or high-level parties, it really doesn’t involve the dark-fairytale style of weird fantasy that defines Dolmenwood. Drigbolton’s events are initiated by events outside the wood, and have the potential to greatly alter the direction of the campaign. I suggest saving Drigbolton for several levels into the campaign, once the players have gotten a good sense of the nature of Dolmenwood, and the game is ready for a serious shake-up. I’ll post a more complete evaluation of The Weird the Befell Drigbolton in a few weeks, once I’ve had a chance to digest it more thoroughly. I can’t say enough good things about Wormskin. I love the zine’s writing, artwork, and design. The creators’ vision of Dolmenwood—fantastic, weird, dark, funny, mysterious, and familiar yet unexpected—comes through on every page of every issue. Even if you never plan to run a campaign in Dolmenwood, you’ll enjoy reading about this fey-touched forest, and plundering it for bits, concepts, tables, characters and adventures for your own fantasy campaigns. But give running a campaign in the Dolmenwood some serious thought…the only thing I want to do more than run Dolmenwood is play in it! All artwork accompanying this review is excerpted from the pages of Wormskin, with the copyrights held by the original artists. When this feature first posted, I incorrectly stated that the sale price of the POD/PDF combo package of Wormskin issues is higher than the price for the print-on-demand copies alone. 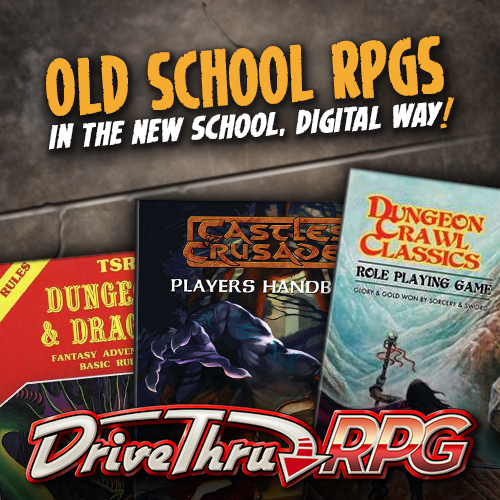 This is incorrect–when you buy a physical copy of Wormskin through DTRPG, you get the PDF for free. I have corrected the text of the article, and apologize for the error. Do you know where I can get the print version Europe friendly? I’m not sure where you’d find a print version of Wormskin or the the other Necrotic Gnome products, but I’d recommend checking out their online home, the Necrotic Gnome blog. You can also reach publisher directly Gavin Norman through Google+. If there’s a European source for printed versions, he’d be the guy who’d know. Good luck!